The people who know me might respond that I’m always surrounded by pictures; there are paintings and prints on the walls of every room. But that’s not what I’m talking about at the moment. I’m surrounded by photographs here on the desk, out on the dining room table carefully stacked against the wall where they won’t be spilled on, or perched atop a box, because I went looking for all the boxes of pictures to create a remembrance, a smattering of one at least, of our forty years’ marriage and family. I had a limited time to take advantage of a promotion that I really wanted to grab, to create a custom photo book. Family photos were one of the things on the list that needed to be gone through and organized since our move last year. I found two boxes I was hunting and realized that another was beyond my physical ability to unbury at the moment. I pulled things out and sorted them. Going through the stacks, old and older, I looked at pictures I didn’t remember existed. A carefully packed envelope for each of us had various black and white prints from our childhoods. There are shots of each of my grandmothers holding me as a baby; one set of grandparents lived in Washington, D.C., and I grew up with them, but the others lived in California and that grandfather died just as I was turning seven. I wish there was a picture of him with me, as well — he was probably the one with the camera. I have memory of one visit they made to us before then, and I remember seeing them briefly in Utah when we were all visiting there at the same time, but there are no pictures. We saw my grandmother several times over the years, visiting us or visiting her, but I have pictures of exactly two events: those couple of shots of her carrying my infant self, and one I cherish of her sitting with me at my wedding. We had tremendous adventures growing up, major road trips through the United States and Canada, but we didn’t have a camera. My mother made sure we had school pictures, so we can all look through the years and see how we changed, but we have no common, ordinary snapshots of siblings experiencing things together. That’s a loss. In my husband’s envelope, there were the only baby pictures he has. There’s also a picture of him at about age six, two in high school that look identical except that one has a dark shirt and a few pimples and the other has him in a white shirt and black bow tie, and there’s a shot of him behind the counter of his father’s store. He grew up in a smallish town north of Salt Lake, and his father had a drug store. One of my delights was finding two shots, different years, of our kids and their grandfather in that same store, the same pharmacy shelves behind them. Spread about me are smiles, milestones, and memories that I know I have to put away now so that they don’t get lost or damaged. They’re not going to be piled back into those boxes, but sorted and labeled into big envelopes and manila folders. I have empty drawers ready and waiting. I had copied for my oldest daughter last year a couple of black and white simple prints from the day she was blessed, when she was ten days old. My father was in town for a few days, and so we took advantage. In truth, he had come to reclaim my mother who had been with us for a month, on the premise that you never knew when first babies would come — so she came early and of course I delivered late. I found more pictures from that day, each with its own selection of relatives on both sides — all the grandparents and some of the great-grandparents. The one I linger on, though, is one I thought we’d lost. 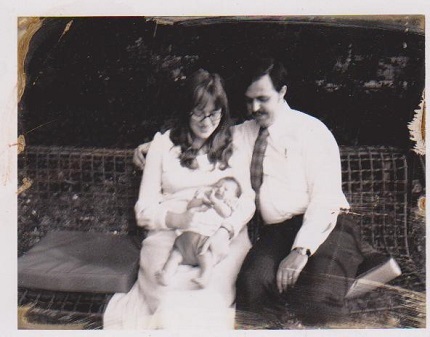 The image is a little damaged in the edges, but it shows me and my husband holding this brand new little person out in the garden. We’re gazing at her, in the wonder of having her. She was our third pregnancy. We hadn’t suffered through colic yet, or teething, or tantrums or traumas. We knew that whatever the particular assortment of troubles would be for this child (or later children), there would be some. There might be many. They might be wrenching. But this beginning was as blessed as each beginning is in life. It’s wonderful to have some visible record of our lives together as a family. We never had a video camera, so we weren’t tempted into spending so much attention capturing our events that we weren’t fully in the moment as we lived them, but we were able to freeze some moments for later, and later has come. There are gaps, but there are lots of chances to reminisce. I have to tag the years by who’s there, or not there yet, and who’s gone. Six children with fifteen years between the first and last cover a lot of years. I have to decide how to group them and label them for storage. There are formal family portraits, school pictures, vacation snapshots, and activities at home or elsewhere. Pictures grouped around the arrival of each new child in the family usually have my mother present and my husband with the camera, not in the shot. We made him be in a few of them. One that’s fun is taken with the string of us lined up sitting in the open side door of the minivan, with baby number five, about that many days old, held on my lap. Some are posed on the porch, or in front of our little apple tree. There’s a shot of the Christmas “pageant” concocted by the three older girls for family home evening because there was now a baby boy to stick in the box (as a manger) to be the baby Jesus. As one of those daughters put it this week, it didn’t work the next year when he was old enough to crawl out and not cooperate. They rigged up costumes all on their own, used a twirling baton for a shepherd’s staff, a bath towel for Mary’s head scarf, and pinned a white sheet for the angel. What fun it is to see now. As I went through the stacks, the envelopes, and the boxes, what meant the most to me was that the pictures and the memories were happy. It’s the smiles that linger with me. This hasn’t been a chore to get done and feel relief. It’s been a process touched by the Spirit, and it’s lifted my heart. We went through very difficult times through the years, for a variety of reasons and in a number of ways. I imagine most families could say the same. But underlying any of that was always a sense of safety that we had love in our home and the Lord as our help. He has the power to redeem our mistakes, our missteps, and heal the hurts we may cause because of them. We weren’t perfect, and no one ever is. But we were blessed, all along the way. We continue to be blessed. I am struck, not for the first time, by how little we can know of what lies ahead for our children individually and who they will become, but how much we do know as we do our best to lay a foundation of love, safety, and faith as they grow up in our care. They each have to figure out their own way, as we had to figure out ours. I am amazed, and grateful, at how all of our imperfect efforts and bumpy paths — even very rocky ones — can yet lead us along to joy.